To think or not to think becomes a paralyzing psychological conflict for Hamlet when he can't even have a day of play, and using toys to tell his tragic story is itself a representation of lost innocence. Leev Theater Group, The Public Theater's LuEsther Theater, New York, N.Y. This is a "free adaptation of Shakespeare's Hamlet," reads the legend on the screen above the stage at the opening of Hamlet, Prince of Grief. Like many such adaptations, while it plays loose with the facts of the original, it holds hard to some of the truths in Shakespeare's play. Among those truths: Growing up is a tragedy, Gertrude is the real murderer of Hamlet's father, and Polonius is a squeaky penguin. Afshin Hashemi as Hamlet describes the fate of his girlfriend in the Leev Theater Group's production of Hamlet, Prince of Grief at The Public Theater. 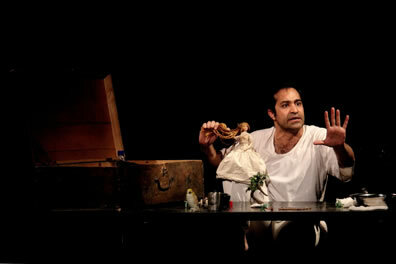 Hashemi's Hamlet used toys to tell his story in this one-man show. Photo by Medhi Shaban, Leev Theater Group and The Public Theater. From Iran's Leev Theater Group comes this one-man show starring Afshin Hashemi as the titular character, part of The Public Theater's Under the Radar festival highlighting new theater from around the world. The 30-minute play consists entirely of Hashemi sitting behind a table describing the day he took off from university studies for a picnic, a day of no worries, a day of not thinking—the day he learns of his father's death. Hashemi has with him a suitcase filled with all the things he needs for the picnic: among them, a pot for cooking, a small mat, a colander, rocks for fire, a flashlight, cotton wadding, his truck (Tonka size), and his family and friends, represented by a pile of plastic toy animals. As he tells his story—from his father's death and his mother's and uncle's wedding through learning from his father's ghost how he was murdered—Hashemi uses these props on the tabletop as visual aides. The flashlight shining through the colander is a starry night, the cotton wadding turns into clouds, the mat becomes a deathbed. Meanwhile, the toy animals play out their parts: the lion is his father, the penguin his father's counselor, the raptor dinosaur is his uncle, and the elephant is his mother. Ophelia is a long-tressed doll. Mohammad Charmshir's script is a modern take on the tragedy of Hamlet, with Shakespeare's plot serving only as a suggestive outline. The family may not be royalty in the classic sense, but Hamlet's father is apparently a king of enterprise. A key change in the plot is his mother's role in the murder: She is the one who pours the drops of poison in her husband's ear. When Hamlet's uncle comes upon the scene, the dinosaur pauses, then breaks into laughter. They later do in the counselor, too, who suffers a squeaking death. Interpret this alteration however you will; just remember this is Hamlet's story, his perspective. His tragedy is not merely the events that make Denmark so rotten, it's lost innocence, an undercurrent theme in Shakespeare's version, too. "The time is out of joint," Shakespeare's Hamlet says: "O cursed spite, that ever I was born to set it right!" Hashemi's Hamlet sadly notes that we cannot go back to childhood "when you were naïve," and because you can't go backward, "You have to go forward, further, further." The opening line of Hamlet's most famous speech appears on a billboard Hashimi's Hamlet sees on his way to the picnic. But a more pertinent echo of the famous phrase is in this Hamlet's desire for a day "to not think." To think or not to think becomes a paralyzing psychological conflict for Hamlet when he can't even have a day of play, and using toys to tell his tragic story is itself a representation of lost innocence. While the script is intriguing (the play is in Farsi, with English translation projected on the screen), Hashemi's acting is what makes this production so engaging. His Hamlet is weary; weary of school at the beginning, weary of the subsequent turmoil in his life, weary of having to constantly be moving forward further and further, weary to a state of physical exhaustion and mental withdrawal. The show has its humorous moments (Hamlet is playing with toy animals, after all) and Hashemi's dry delivery brings home every joke. Though he is sitting behind a table throughout the show, the physicality of his performance is striking; Hamlet's internal struggles articulate as much in Hashemi's gestures, expressions, and eyes as it does in the lines he speaks. One other important prop is not in the suitcase; it's Hamlet's cell phone in his jacket pocket. When his phone rings, Hashemi answers as if breaking character—not Hamlet answering the phone in a play but Hashemi casually answering his phone in a theater. However, each call serves as a plot driver: news of his father's death, his mother asking him to come home first for the funeral and then to attend her wedding. The final call is most telling, his uncle wondering where he is, and Hamlet assuring him he's entering the alley to their house. This leads to Charmshir's most poignant twist in Shakespeare's plot: at last, Hashemi stands up, turns around, and reveals Hamlet's fate. In this modern take on Shakespeare's Hamlet, we realize that today's Hamlets would not necessarily even make it back home.